As we head into the final months of 2018, SCN is accepting entries for its 2018 Top 50 Systems Integrators list. Enter today to see where your firm stacks up against other major commercial AV installation firms. 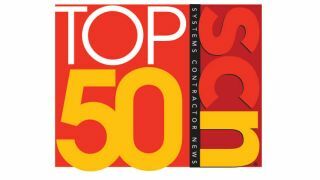 The top 50 entries will be featured in the December 2018 issues of Systems Contractors News. View the 2017 SCN Top 50 Systems Integrators. The SCN Top 50 Systems Integrators list is based on each company's revenue for commercial AV system design and installation, as well as its total revenue for the current year. To be eligible for Top 50 consideration, a company's revenue for commercial AV system design and installation must account for more than 50 percent of its total revenue. Entries must be submitted by November 5, 2018 to be considered. Follow the survey link, complete the necessary information, and you'll be on your way to being recognized amongst the top companies in pro AV. If you have any questions pertaining to the list, please contact Jessika Walsten at jessika.walsten@futurenet.com.